I love macarons! I’m pretty sure I have said it before. I love making them and I love eating them but I love giving them away most. They are not something that most people have very often, if ever so it’s fun to give someone a treat. I get a lot of satisfaction for very little effort! If you are reading this and have never made macarons I know you are thinking I am nuts to say they take little effort. 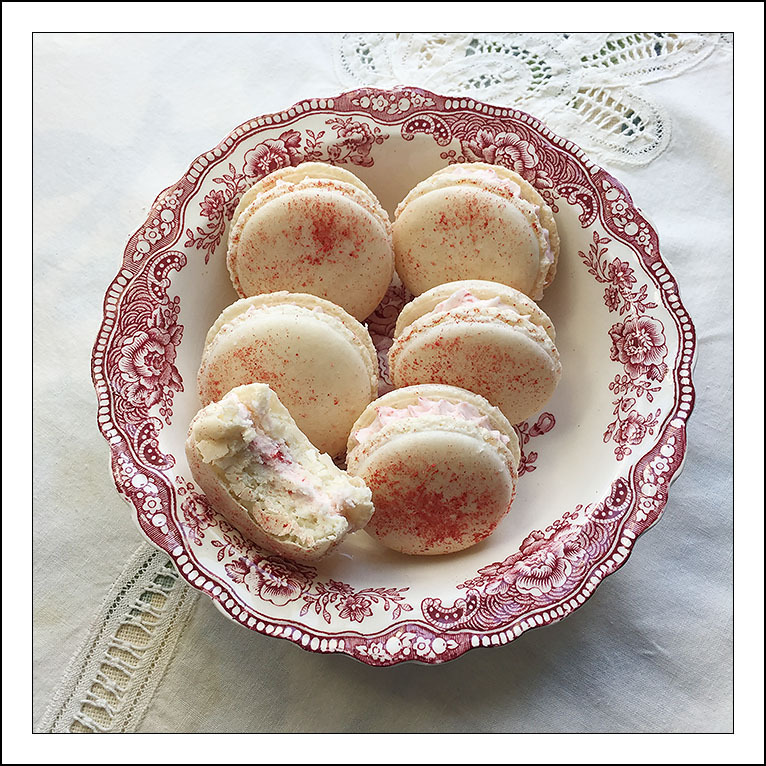 If you have read macaron blog posts and recipes you have likely read about all of the pitfalls of making them. You have read how “finicky” they are and how you will have to persevere and keep trying. I’m here to tell you that you don’t need to pay any attention to all of those warnings. I spent about a couple of months trying to master making them. I had read that I needed to age my egg whites, that they needed to be room temperature, that I couldn’t make them on a humid day, that I needed to let them rest on the cookie sheet to form a crust, that my oven temp was critical and that I MUST weigh my ingredients. All of this is baloney. Well, I do weigh my ingredients because it’s so much more convenient than using measuring cups but the rest of those warnings I ignore. I think fear is what stopped me from having success and it stops others from trying. My attitude changed when I talked with a woman from Paris who makes macarons for a living. She works in a Parisian bakery making about 500 macarons a day. Her kitchen is in the basement of a 300 year old building. She told me that if she had to wait to have a dry environment she would never get any macarons made. She said her basement kitchen is so damp that the walls are moist. She doesn’t age her egg whites. She also told me that she didn’t have room to store the macarons while they developed a shell. She pipes them and pops them in the oven. She told me that the single most important thing to learn is the macaronage. That is the technique of folding the dry ingredients into the meringue. Once you get that figured out you are on your way. I did a little video to show how it’s done and what it should look like. I’m a visual person and I hope that it will help you to see it rather than just read about it. Emboldened with her encouragement I made a batch of macarons. I had great success time after time. They are now my go to cookie when I need something special in a hurry. It takes about 1/2 hour to mix up a batch of macarons. While they are baking I can make a filling (even if it’s sometimes straight out of a Nutella bottle). The sky is the limit when it comes to shells and fillings. This is a link to a post on tips for making macarons so you will have success too. I hope you love these as much as I do! Let me know if you have any questions!! Sift Almond Flour and Confectioners’ Sugar into a bowl and then whisk them together until they are well mixed. Put egg whites, granulated sugar and salt into the bowl of your mixer. Start your mixer on medium (about 4 if using a KitchenAid) and beat for a few minutes. Gradually increase the speed to high and beat them until the meringue is stiff, glossy and almost dry. If you want colored Macarons now is the time to add a gel food color. I don’t recommend liquid food coloring. When coloring macarons make the color a little more intense than you want the finished product to be because the color fades in the oven while cooking.Next, add the dry ingredients to the meringue. Mix until incorporated. You don’t need to be too gentle at this point. When no white meringue is visible start the macaronage. Remember that macaronage (the French term for combining the ingredients) is about deflating the whites, so you don’t have to treat them gently. You want to knock the air out of them. Stir to deflate the egg whites until the batter is the consistency of lava and flows off your spatula. My video shows an example of the method I use to mix the batter.Pipe the batter onto either parchment paper or a silicone baking mat (I prefer a silicone mat). I have the best success with cookie sheets that have low sides, not sheet cake pans. Use a small strainer to shake some of the strawberry dust on half of your macarons. Bake at 300 degrees for about 15 minutes. All ovens are different. If you aren’t sure that your oven is accurate, you may want to check it with an oven thermometer. To be honest, if you read enough macaron recipes you will see temperatures from 260F to 325F. The temperature isn't that critical as long as you don't set a timer and walk away until you know how your oven bakes them and how long they will take. Check to see if they are done by giving them a little wiggle with your finger. If the tops move easily, they are not done. You want them set but not firm. It’s better to be a little underdone than over done. Let cool completely before trying to remove them from your parchment or silicone mat. If you need to use your cookie sheet again just pull the liner onto a cooling rack and let your baking sheet cool completely before piping more macarons on it. Once cool match your cookies and fill. Beat butter for about a minute. 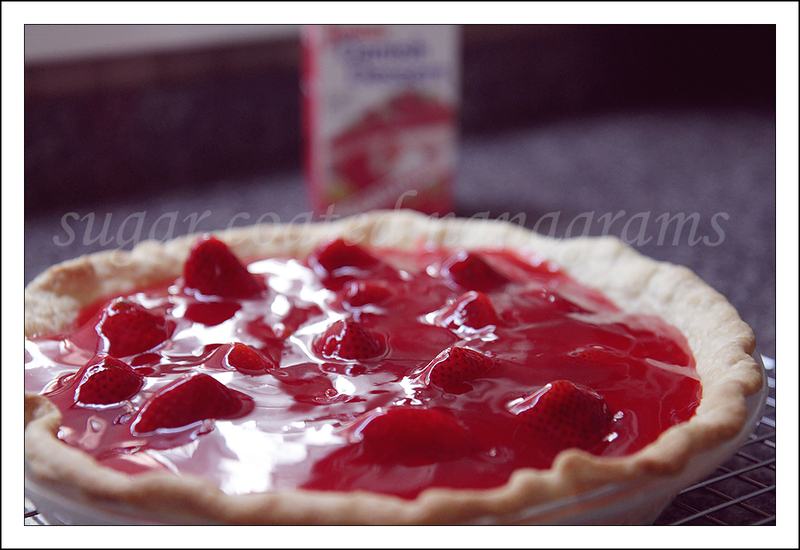 Add remaining ingredients except for the strawberries and beat until light and fluffy. When adding your milk start with 1 tablespoon. Add more if your filling is too stiff. Put strawberries in a baggie and crush with a rolling pin until you have small pieces. Sift the crushed strawberries to separate the strawberries and the amount that turns to powder. You will use the powder on the tops of your macarons. Fold the crushed strawberries into your buttercream. Fill matched cookies. Refrigerate for 24 hours. Keep refrigerated. Bring to room temperature before you serve them. You can eat them right away but they are best the next day. They also freeze beautifully, either filled or unfilled. We went to visit our son and his family last week. Because both girls love to bake, I frequently bring the ingredients necessary for a baking project. 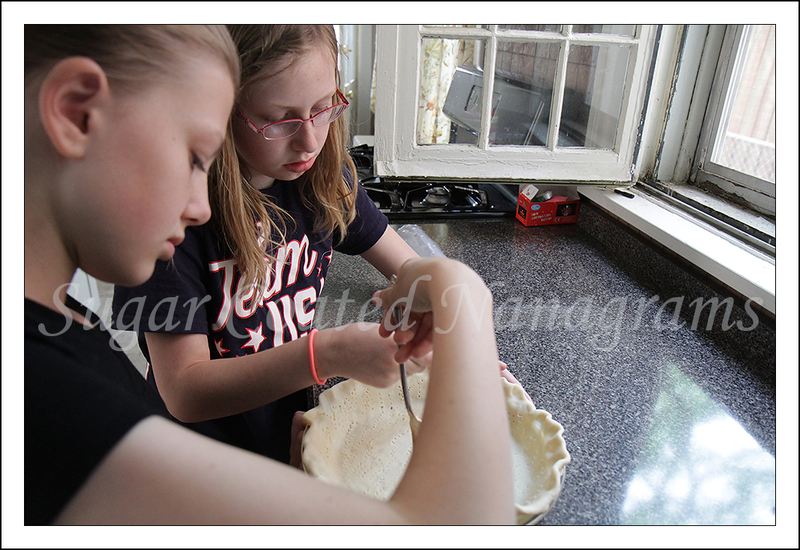 On this trip I thought it would be fun for them to make a pie that my mother-in-law made every summer. It is really easy, and quite delicious too! I haven’t made this pie in many years because one of the key ingredients, Junket, is not available where I live and I could never figure out a substitute for it. Thankfully, our family has a Facebook page that we use to chat about old memories and to stay connected with one another. Someone mentioned my mother-in-law’s pie, and I replied that I couldn’t find Junket anymore. Three days later there were three boxes of Junket in my mailbox! My always thoughtful sister-in-law must have gone shopping right after I mentioned it. She mailed it to me immediately! Just one of many reasons my kids and grandkids love their Auntie Barb! I had never heard of Junket before my mother-in-law introduced me to it. The package says it is a Danish Dessert, but I have never used it for anything other than this pie. If you want an easy, delicious and impressive dessert (and one your children or grandchildren can easily help with! 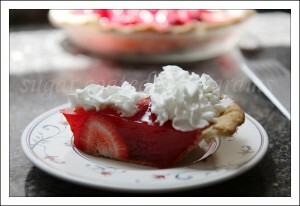 ), you should try Dorothy’s Summertime Strawberry Pie! The girls unrolled a pre-made pie crust, put it in the pie plate and are now pricking the sides and bottom so the crust doesn’t shrink. I normally make my own pie crust but the one from the grocery store is very convenient when you are short on time. 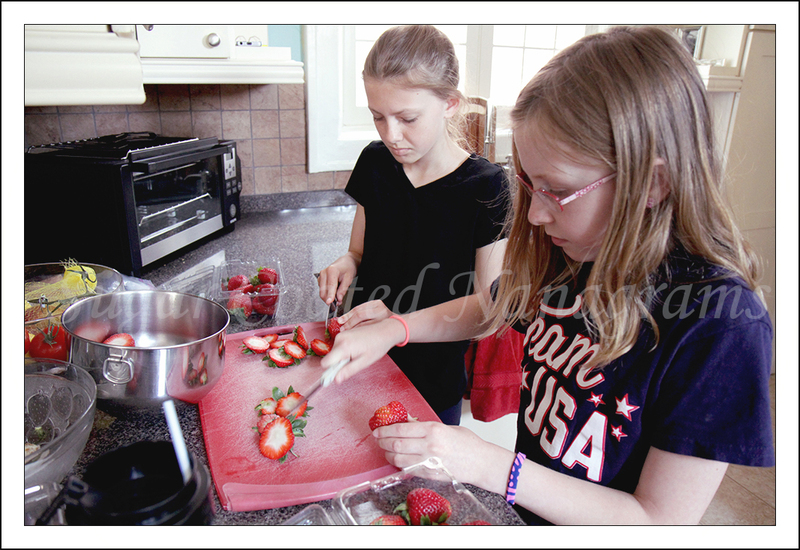 While the crust is baking they are cleaning the strawberries. When the crust has cooled a little, they placed the whole strawberries into the pie crust. I poured the Junket over the strawberries. It was hot and the pan was too heavy for the girls. Bake a 9″ pie crust until golden. Prepare the Junket according the directions for Pie Glaze, on the box. 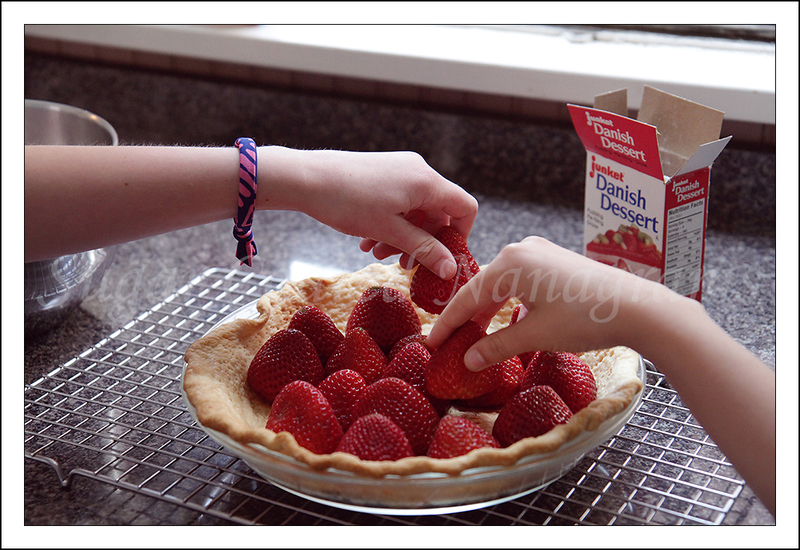 Put cleaned strawberries into the pie crust, pour warm Junket over the berries. Refrigerate until cold. Serve with whipped cream.